Welcome to the 2018 Swaffham Rotary Visual Arts Festival. On behalf of The Rotary Club of Swaffham – Welcome to the 2018 Swaffham Rotary Visual Arts Festival. Over the 20 years since the first Art Exhibition in the Mundford Village Hall the Exhibition, the Festival has grown and demonstrated how rich West Norfolk is in Arts and Crafts. The Festival aims to reflect and showcase this wealth of talent. Every year the Festival has increased in content and popularity with the emphasis on ensuring that the events can be enjoyed by everyone and from which anyone can learn more about the variety within the Visual Arts and be stimulated and entertained. Films, a theatre production, talks and demonstrations; displays of jewellery and sculpture; exhibition of paintings, prints, collages and photography by talented amateurs and by acclaimed professionals, have been part of the Festival’s celebration of the Visual Arts. The highlight of the Festival, as ever, will be our Exhibition and Sale of works of art on the 26th to 28th October 2018 at Swaffham’s Assembly Rooms. In addition to raising the profile of the Arts within Swaffham and District, the festival also aims to raise money for Charity. 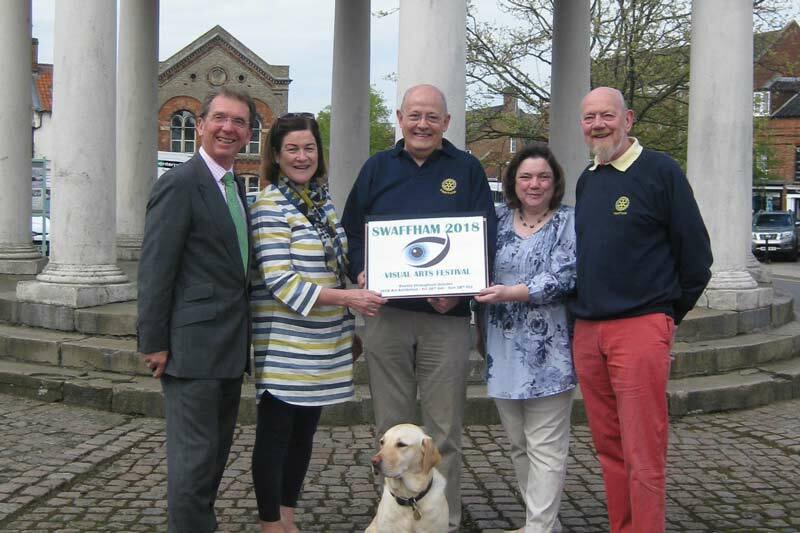 Last year over £6000 was raised for charitable causes and over the last 21 years the Club has raised over £105,000 for local, national and international charitable causes which the Rotary Club of Swaffham supports. Swaffham Rotary, in conjunction with its main sponsor, ABEL Homes, would like to announce the exciting events for this year’s Visual Art Festival in October. 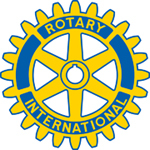 After a tremendous successful year in 2017 when over £6800 was raised for local and international charities, The Rotary Club is very please to announce ABEL Homes continuing support for this outstanding annual event. This year the Festival will open with its Launch event at West Acre Theatre with a talk and a display of work from the internationally acclaimed installation artist Rebecca Louise Law. Rebecca is best known for artworks created with natural materials, namely flowers & flora. The physicality and sensuality of her work plays with the relationship between humanity and nature. Rebecca is passionate about natural change and preservation, allowing her work to evolve as nature takes its course and offering an alternative concept of beauty. Her notable commissions have include ‘The Grecian Garden’ (Onassis Cultural Centre, Athens), ‘Outside In’ (Times Square, New York), ‘The Beauty of Decay’ (Chandran Gallery, San Francisco) and ‘Life in Death’ (Shirley Sherwood Gallery, London). Rebecca’s work has also been exhibited by Bo. Lee Gallery, Broadway Studio & Gallery, NOW Gallery and at sites such as Kew Gardens, the Royal Academy and the Victoria & Albert Museum. This ground-breaking event for the Festival is followed up by a stage performance “Into Thin Air” by the Norfolk playwright Rob John with fEAST Theatre company. fEAST Theatre was formed in 2010 by Rob John and Mandy McKenna and since then the company has been developing and showcasing new work by professional writers, actors and directors from Norfolk and the Eastern region. In particular, it brings compelling new stories, filled with Norfolk voices and untold pieces of the region’s past, that resonate with local audiences. It is a real pleasure to bring fEAST to Swaffham and to provide a new visual element to the Festival. 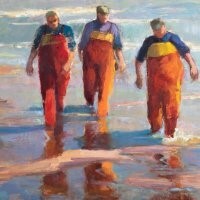 Other events will include a talk and display of work from the well known local artist Jane Hodgson. Jane was born in England to New Zealand parents, something that has informed her work, and meant she moved from London to Norfolk on her return from working in New Zealand in the 1980’s. Jane, currently exhibiting at the Pink Foot Gallery on the North Norfolk coast, has agreed, in a break in her busy schedule to come to the Festival this year. Besides her talk, she will also be exhibiting at the Annual Exhibition at the end of October. Following on with the Visual Arts theme, Swaffham Rotary will be opening its doors to show a film as part of its End Polio Now campaign, to raise awareness and to support the worldwide campaign for its eradication. The premise is daunting. 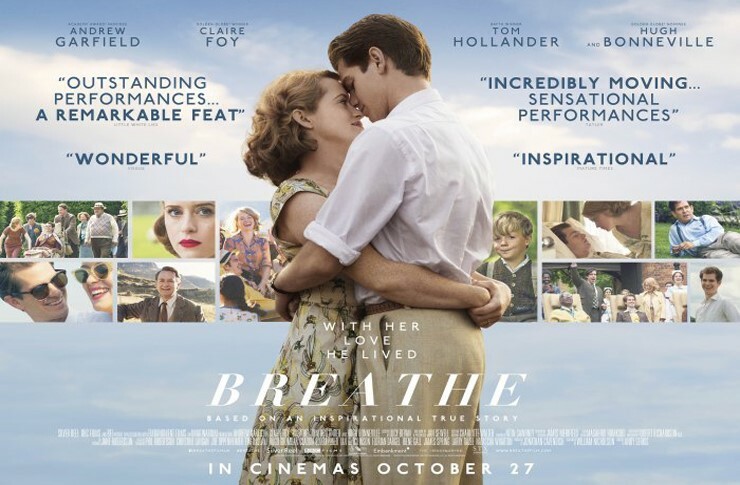 Breathe (which opened the London Film Festival) is a biopic telling the story of Robin Cavendish (played by Hugh Bonneville), a dashing upper-class Englishman struck down with polio, paralysed from the neck below and given weeks to live. It’s a grim starting point but the film (the directorial debut of actor Andy Serkis) makes rousing and surprisingly entertaining viewing in its own very British fashion. All the events will lead to the finale which is always the very successful Annual Art Exhibition which celebrates the best of local art, from lino printing to oils, from photography to watercolours, from silver craft to pottery. The show will be on for 3 days with the popular Preview evening opening.